Oriental bittersweet is a deciduous woody vine native to northern China, Japan and Korea growing up to 60’ tall often girlding and killing nearby shrubs and trees. It is a member of the bittersweet family, Celastraceae, that also includes crucifixion thorn and euonymus. Spindly, reddish brown striated stems carry light green elliptical to circular leaves that are two to five inches long. The small, inconspicuous greenish-white male and female flowers are axillary and appear on different plants from late spring to early summer. 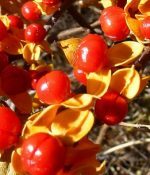 They give way to small round fruits that are green at first but ripen to yellow and split open to reveal scarlet berries that persist into winter and are valued by flower arrangers. Oriental bittersweet was introduced to North America in 1879 as an ornamental, has naturalized, and is now considered invasive in Eastern US. Care: Vigorous growth needs to be controlled.